This week Martial and Miranda are attending YWAM's communication consultation, otherwise known as CRIT: communication, research & information technology. It's an annual gathering for anyone involved in these areas within Youth With A Mission and was initiated 4 or 5 years ago when YWAM realised it had to get serious about strengthening its communication infrastructure. There's a strong international contingent - people are here from as far away as South Korea - but each year there is a particular focus on the host region. Next year we will be hosting CRIT in Africa, which is very exciting. South America has a pretty good track record when it comes to the communications sphere. There have been some great video and graphics initiatives, as well as training courses being run by teams around the region. In spite of that there has been too little focus on communication within the organisation, leaving a great need to facilitate stronger connections between YWAM teams. This is especially the case between those teams in Brazil, which is Portuguese-speaking, and those in the rest of Spanish-speaking Latin America. There are various working groups taking place throughout the consultation, helping to make progress and build momentum in the main focus areas. 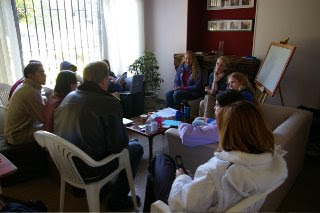 Miranda writes: The group I am helping to facilitate is working to launch a Communication Team for Latin America. Having been a part of starting AfriCom it's fun to work at the process - it's a lot more noisy than I remember our first meetings, with a dozen Latinos all making their voices heard! Things came together pretty well today and it seems that by the end of the week we'll have leadership in place and some initial goals and projects for the team. Some of the EuroCom team are also at the consultation. The various individuals are all part of different working groups, so not officially meeting together. Having said that, they're a bit stuck and feel that leadership issues have prevented them making progress in Europe, so there have been some extra meetings with them to look at those issues. After working so hard Martial and Miranda will have to come back to the office for a holiday!